I hope everyone had a peaceful & happy holiday season. 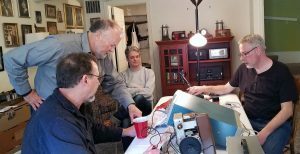 As we all pursue our various winter season projects it’s time to look forward to our next meeting and the years’ activities. 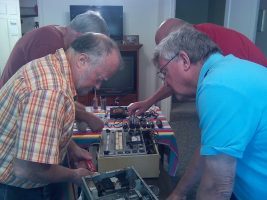 With that in mind, our next club business meeting / repair session is now set. Please put this on your calendar. WHEN: Saturday March 2 (alternate date March 9th see below) 10 AM – ??? WHAT: Our. 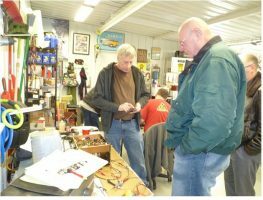 more or less, quarterly meeting to discuss club business and one of our on-going, hands on repair & learning sessions. As has been my practice, I’ll keep the business part of our meeting as short as possible. 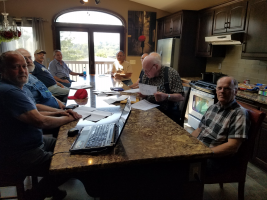 I anticipate that the main topic of discussion will be regarding our upcoming auction on May 4th, however, as usual the meeting is open for anyone to bring up any item for discussion. 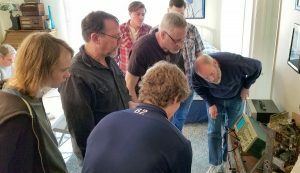 After that we’ll roll into one of the ever popular, hands on repair & learning sessions so plan to bring your repair project(s) of interest or wherein you’d like someone else’s input. 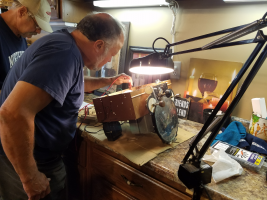 Keith is newly retired and, while he’s always provided a great set up for our meetings there, he tells me that one of his first priorities is a reorganization of his workshop. So please plan to attend to congratulate him on making it to ‘the golden years’ and to share in our common interests & hobby. As always, lunch will be provided by the club. ALTERNATIVE: In the unlikely event that there’s a late season storm making travel difficult, the alternate date for this meeting is March 9th. 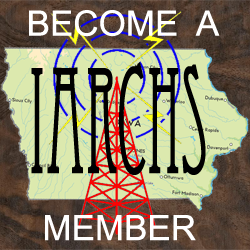 If there’s a question about it, please call Keith at 515-205-6188 (first) or me at 641-485-7919 (2nd). WHAT TO BRING: Your repair projects for the usual after the business meeting project help / learning session, and your enthusiasm! 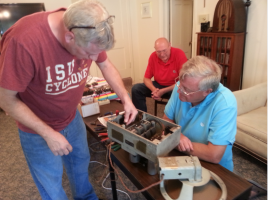 ALSO, If you are an experienced restorer and have a favorite / unusual piece of test gear, please bring it along. 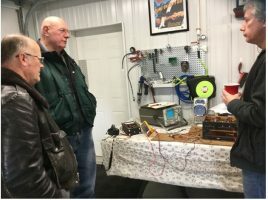 Jerry is a more recent member and he tells me he has he space and desire but limited test equipment; he does have a tube tester, I will be bringing a couple meters, a variac and a dim-bulb tester, so those won’t be needed. 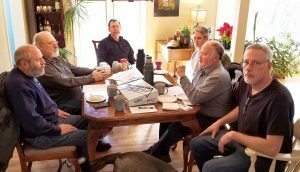 President Dave Perkins brought the meeting to order at 10AM at Jerry Lange’s home in Dubuque, IA. 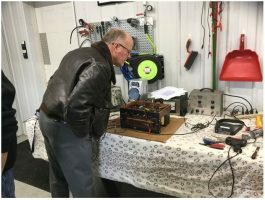 Old Business: The next annual radio auction is set for Saturday April 28th 2018 with radio check in on the 26th and 27th. Same location and format: Hawkeye Downs auction arena, Cedar Rapids, IA, Wears Auctioneering will conduct the auction again. 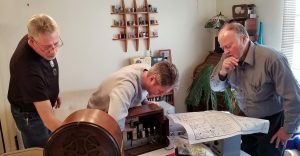 as we approach the auction the usual planning and volunteer requests will be made. New Business: Webmaster David Fitkin explained the need for an “https” secure website certification to make our website safe to use and encourage more “hits.” The charge is $50/year. Moved, seconded, adopted by consensus. Newer member Dave Stewart asked about finding repair people. This is a continual challenge for the club. 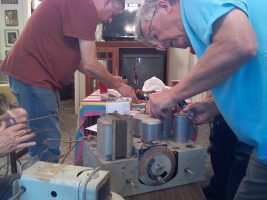 Anyone willing to repair old radios is asked to contact us and be listed on the Repair Service web page. Many repairs are arranged informally. 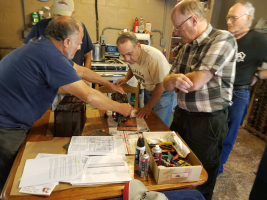 Having an announced repair topic coverage at the meetings was discussed but is challenging due to the many different levels of skill by attendees. Listing some “YouTube” links (to good instruction videos) on our website will be offered as a partial solution. Next Meeting is tentatively January 13th or 20th, 2018. 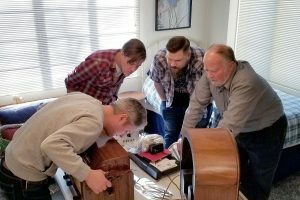 A host volunteer is sought. Please contact Dave Perkins to volunteer. 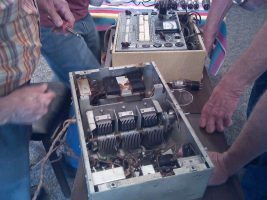 John O’Briant had brought up a Zenith Walton chassis and speaker. He says it was a great auction buy but had been dropped at the auction. Candohm resistor failure was part of the diagnosis. 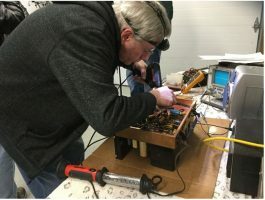 Jerry Rappel had the Airline bakelight case radio which needed to begin with the basics of tube testing and electrolytic capacitor replacement. now where is that bug hiding? Submitted by IARCHS Secretary Doug Spyrison text and photos. 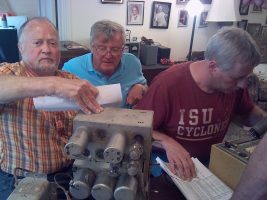 On Saturday June 10, 2017 a club meeting was held at the home of Rob Tracy in Des Moines. Due to schedule conflicts, it was a small gathering. 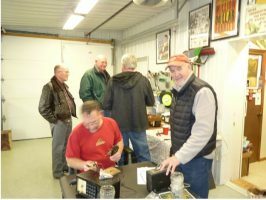 In attendance were Rob, Al Bailey, Craig Huseboe, Dave Perkins and new member Ron Russel. 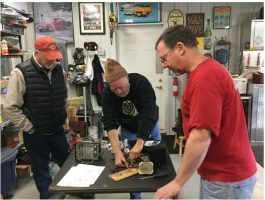 Business and Discussion: Craig reported on the April auction. 550 lots were sold with gross sales of $22K The club netted $462 which is an improvement over previous years. (One expense was still pending as of this report.) The improvement was primarily due to the reduced advertising expenses this year. 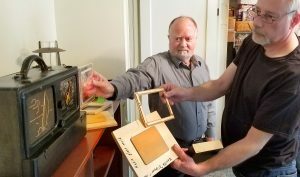 The feedback we got from the crowd and the auctioneer’s staff indicates that our switch to a combination of direct mailing to past participants and on-line promotion away from multiple print ads, worked well so we concluded that we will stick with that for the foreseeable future. Also, both from the crowd and the auctioneer, it seemed that moving the auction up one week earlier than in the past worked quite well. 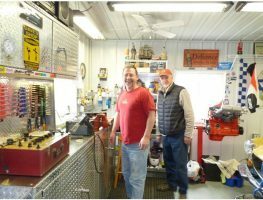 Craig said that Wears Auctioneers will be available so we decided to set the tentative date for the next auction of April 28, 2018. In other discussion, a couple of members have commented that the club should be better at keeping the event calendar up to date. No one person is charged with that task so those that have access to it haven’t always thought to take care of that. [Note to all, I’m one of those people and guilty as charged, I’ll try to be more diligent and if you see something that should be there but isn’t please ‘ping’ me]. Another very good suggestion is that we should add a prominent link on the web site’s front page to information on the time and place of the next club meeting. At this point that meeting has not been set. I will be asking, via a general email, for people to volunteer a location. As the last two meetings have been in central Iowa, I’m hoping to have someone elsewhere in the state to offer a place. 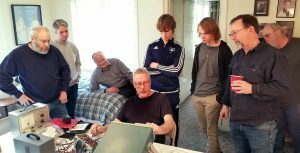 Repair Session: Rob gave everyone a write up on a simple & handy coil tester which should be posted on the website as a separate post. Photos: Rob Tracy in the ISU shirt. Ron Russell in blue, Craig Huseboe in red, Dave Perkins in checks, photos by Al Bailey (not pictured). 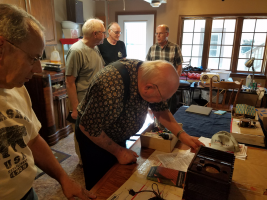 New member Ron Russel, had acquired a couple radios (a Majestic and a Grunow) a week before our meeting. 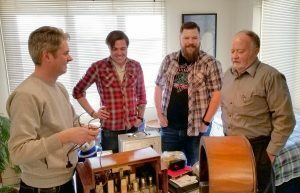 In the meantime he found and joined our club and showed up at this meeting with the Majestic, both to see what it would take to make it play, and to start on the process of learning some about restoration. 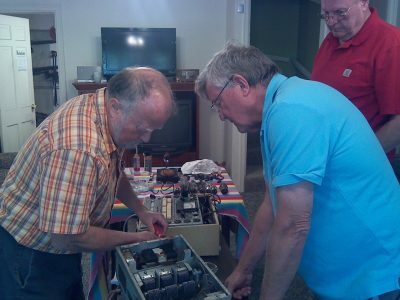 After testing the tubes, cleaning the controls and replacing the power supply caps with parts that Rob had on hand, it did play clearly but at a rather low volume. With some signal injection and tracing and a few more measurements, we concluded that some of the old ‘dog bone’ resistors had drifted out of spec to higher values and, most importantly, the volume control resistance was out of spec. 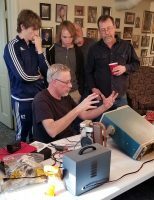 We were able with some jumpers to try some different, resistors but Rob did not have a suitable volume control pot on hand. 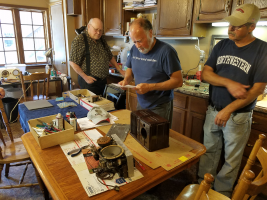 So we concluded our troubleshooting session with some ideas on what to look for in the way of parts and hopeful that he could at least acquire the necessary parts. 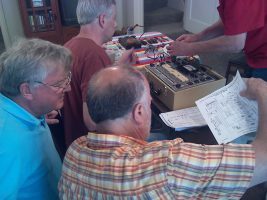 It was a steep learning curve for someone who’d never looked at a schematic before, so Ron, if you get hung up on your project, keep in mind that you can always bring it & some parts, to the next meeting once I have it set up. That’s it for now. Everyone enjoy your summer bargain hunting at flea markets and yard sales, keep cool and watch for an announcement of our next meeting time & place.